Is the basic website setup wrong from the start ? What are the best solutions ? What's the best and easiest way to host & manage your website ? How do you lay-out and structure a website to get the most leads ? 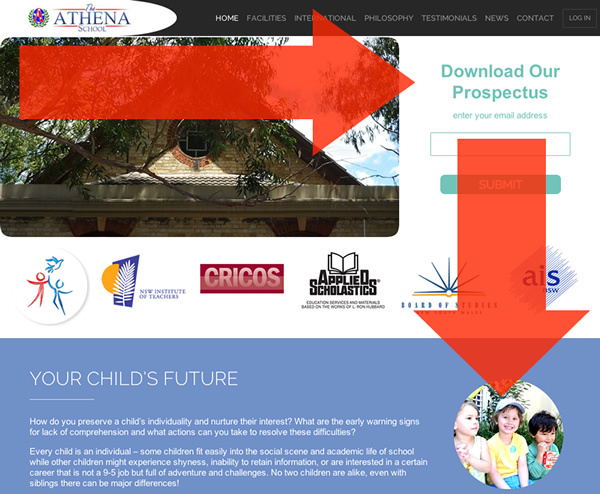 In the image below, the big arrows show the eye-trail across a website for Western-language people. They look top-left, then across and down. This is a website that we set up for one of our clients. Since then they’ve had a steady stream of contact email addresses from people who download their prospectus. It’s stacks easier when you can use what’s working well for other people as a starting point for your website and marketing. Things that work well for other people usually become best practices which can save you doing lots of testing that’s already been done. 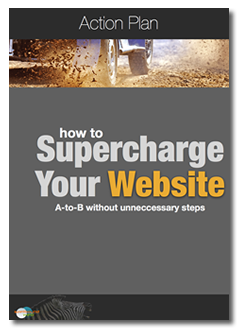 Here's an action plan that covers how to set up a website so that you can run lots of marketing campaigns with the least amount of effort. It’s 7 bucks, which will save you spending the thousands we have been to work it all out. You can get it right now by clicking here ( using Paypal ). If you're serious about handling your online marketing, setting the website up corrrectly will make things easier and faster for you. Choosing the right website platform for your business. The ideal server and hosting control panels. How to configure WordPress sites best for marketing. How to get help at outsourcing websites. Creating the graphic look and layout that gets you the most contacts. SEO ( search optimisation ) intro stuff. How to run lots of offers and create lots of landing pages with least effort. How to track what people are doing on the website, so you can do better !